There were 5,663 new electric passenger cars sold last year in France. That’s out of a total of 1,898,872 new cars. In Germany, EVs were 2,956 from 3,082,504 new cars. 1,262 from 2,044,609 in the U.K. ; 4,358 from 137,967 in Norway ; 520 from 1,402,089 in Italy ; 398 from 699,589 in Spain and we don’t have the data for all European countries yet, but total EV sales will be much less than 20,000 units in a 12 million new car market. Except maybe in Norway, EV salesmen have no reason to party. Because there is a clear explanation behind those poor sales and that is a lack of demand. France looks quite good as the European sales leader, but raw data is highly misleading. More than 1,500 cars went to the Parisian Autolib car-sharing service. Then dozens of Renault Fluence Z.E. were counted as new registrations, but the cars were not sold. They’re being used for demonstration purposes. Same thing for the little Mia electric, several cars were sold to friendly cities or administrations which are close to the factory in western France. Sales of the Citroen C-Zero and Peugeot Ion (Mitsubishi twins) are also highly inflated. Hundreds of cars were sold at heavily discounted prices (more than 30% below invoice!). And all that in a market where demand was hugely boosted with a €7,000 cash incentive ($9,133). So let’s not hide from the truth. The electric car is great technology, but the real number of people who want one is dramatically low. Or everyone in the know is just waiting for the Zoe! I’d like to think so, anyway. I see the Zoe having appeal for the younger drivers, people who have never bought a new car before, and old people, but I doubt mainstream buyers will have much interest. Wow, interesting figures! I was wondering what the numbers were like in 2011 to see the (possibly very little) development of each market for Ecars. Where could I find those figures? I don’t have them with me, but I’ve seen them and they were poor, much inferior to 2012. 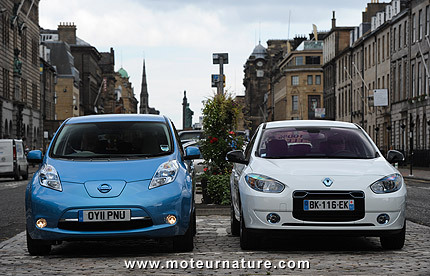 But then, the Nissan Leaf wasn’t available in several European countries in 2011.